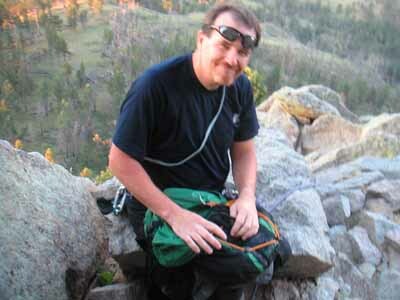 Hi SummitClimb, this is Doug. I am hoping Marc, Ben and Kevin are all back safe and sound now. I made it back last night and had a good sleep, though I am up early and not wanting to be! (photo: Cheryl Goodwin - Good2GoPhotography.com (all rights reserved). Thanks for a great trip. As I wrote in the dispatches, the team members were great: determined, flexible, fun and inspirational. It was great to travel and climb with you all. I have been in Nairobi 2 days now where the political situation and on the ground seems to have gone from bad to worse in spite of Kofi Anan's visit. That being said it would be very hard to tell that anything was wrong from my own eyes. The violence and ethnic conflict is very much centered in certain areas and if one isn't in those areas it feels very far away indeed (photo right by Arnold Coster: Team member on the summit of Kilimanjaro). The political situation gets more complicated all the time and it seems sure that the violence will still go on for some time. Although many in Kenya are affected deeply, many others still carry on with their daily lives as normal, though it is clear that everyone is dismayed and concerned about it. I think on a deep level Kenyans never thought that this kind of political/ethnic violence could happen here and there is a deep fear that it will grow. That seems to be the thing that people don't want to believe, nor talk about. Otherwise, I am ready to get on the plane. I will catch up with you when I get back. The team is heading home. Hey SummitClimb, this is Doug of the Mt. Kenya and Kilimanjaro Expedition. It’s about 4:00 on Wednesday. I’m here at the Namanga border crossing, going back into Kenya. Kevin left yesterday on the same shuttle for Nairobi and I know he made it to the hotel and picked up his luggage and I’m pretty sure made it out on his flight, so he should be on route back to the US. Ben is flying out Kilimanjaro airport, so he is staying one more night there and will be flying back to the US from Tanzania. Everyone is doing fine. We’re anxious to see how things are in Nairobi, so I’ll be calling in some more reports when I see what the situation is. Hiking up toward Tarn Hill on Mt Kenya during our January expedition (Cheryl Goodwin - Good2GoPhotography.com (all rights reserved). Peter Horsey, top Kenyan climber on the Mackinder's boulders (Dan Mazur). Our team member Peterson enjoying the view of Teleki Tarn (Cheryl Goodwin - Good2GoPhotography.com (all rights reserved). We are all safely down from Kilimanjaro. It was a fantastic summit morning on the 26th. Our last nights camp at the crater rim was just beautiful with snow all around. Kevin and I did a short hike to the actual crater rim to look into the ash cone of the volcano. Absolutely striking up there! There was only one other group at our camp site, so for virtually the whole route up to the summit we were by ourselves. 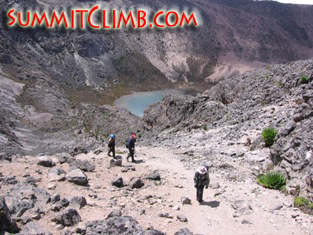 We didn't fully realize how special that was until we saw the hordes coming up from the other side on our descent. Everyone did well and stayed strong and healthy for the whole ascent. Both Kevin and Ben have amazing determination. I KNEW that they would not quit no matter how difficult it was, so it was a real joy to share the summit and sunrise on Kili with them. They are both wonderful inspirational people who continue to make their dreams a reality. I also give them a tremendous amount of credit for being flexible, fun travel partners. With such a small group it could have been hard. Although the morning was colourful and wonderful, the rest of the day it rained. We had managed to avoid most of the bad weather on Kili by getting to camp early, but it was raining after our arrival. Yesterday, after a good nights sleep at low elevation, we made it to the park entrance and were sitting by the pool drinking our first celebratory beers by 1 o'clock or so. We spent the afternoon there chatting with newcomers who intended to head up today. They were all medical students who were doing some work here in Tanzania and in Zanzibar. We wish them good luck on their ascent (photo: Cheryl Goodwin - Good2GoPhotography.com (all rights reserved). It is clear that the Umbwe route with the Arrow Glacier/Western Breach is an absolutely stellar route. We were all very happy with the extra effort and skill it required. Our staff here was also fantastic. They took very good care of us and I thank them all as well. So now our eyes are on the situation back in Kenya. We are saddened to see that things have not improved and the violence has cost more lives. Ben will be flying out of Kili TZ airport and so is going to be fine. Kevin decided to get an earlier flight out of Nairobi and so left on the shuttle this morning to catch his flight this evening. I will be leaving for Nairobi tomorrow to meet with our team there and wrap up some last minute things before flying out on the 1st. I am anxious to see the present scene in Kenya. Ben on the summit of Kilimanjaro. Our high camp near the crater (Doug Sandok). The team has summited Kilimanjaro. Hey everybody. 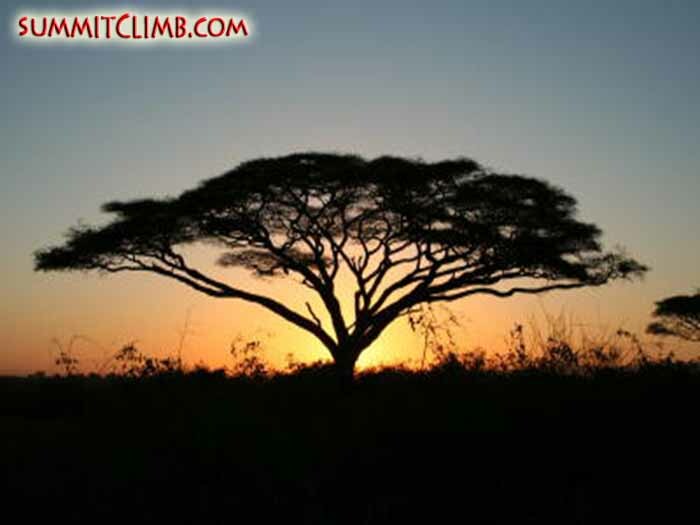 This is Doug calling in from the SummitClimb Kilimanjaro Expedition. It’s about 7:00 a.m. and I’m standing here with Kevin. Ben is already heading down. We’re about 50 metres below the summit. We just summited at about 6:15 this morning. Let’s give a big hoot for that (Wahoo!). We’re doing great. We had a beautiful sunrise this morning. The group was Kevin, Ben, myself, and our 2 local guides, summiting this morning at 6:15 (photo right by Arnold Coster: Team member on the summit of Kilimanjaro). We’re going to head down now and have a little breakfast at the bottom of the hill. We’re sort of doing a traverse of the mountain because we came over the Western Breach and we’re heading down the other side of the mountain. Doug and Kevin on the summit of Kilimanjaro (Kevin Murray). The team is making their summit bid on Kilimanjaro. Hey everybody. This is Doug and Ben calling in from about 5000 metres/16,600 feet on Kilimanjaro. 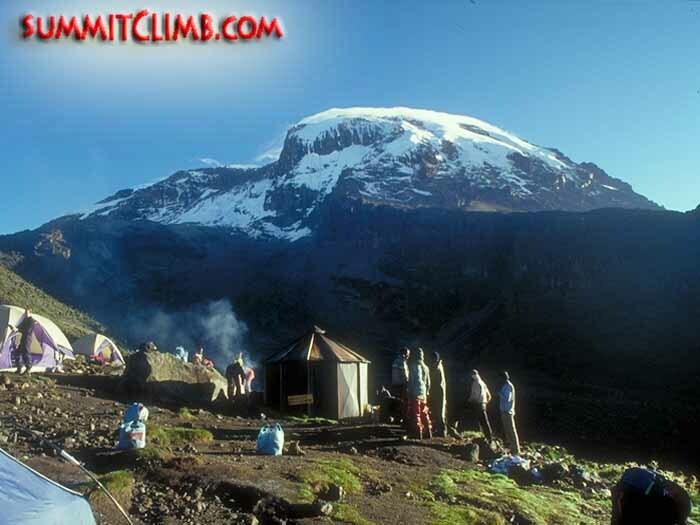 The team is at Barranco Hut on Kilimanjaro, getting prepared to summit. Hey, this is Doug calling in from the SummitClimb Mt. Kilimanjaro Expedition. Kevin, Ben and I are here at about 4900 metres/16,000 feet at the Barranco Hut camp. We’re right at the base of the snowy summit cap of Kilimanjaro. It’s a beautiful place. We hiked through the forest the last two days. It started to open up today just before we got to this camp. We managed to get here right before the rain started, but we did have a little bit of rain this afternoon. Now it’s clearing up and we’re able to see up to the summit of Kilimanjaro, as well as way down the valley towards Moshi. We can see a plantation that produces sugar cane in fields. Everybody is doing well. We’ve got a great crew here working with us of excellent cooks, guides, and porters. They’re all fantastic. An interesting thing about Tanzania is the porters carry stuff on the top of their heads as opposed to the porters in Kenya, who carry it similar to how we do it with backpacks. These guys are great and have been taking really good care of us. The team had a great safari and is ready to climb Kilimanjaro. Safari Time! There is nothing like seeing amazing wildlife in the shadow of our next objective, Kilimanjaro (Bill Weber). Hey, good morning everybody. This is Doug with the Mt. Kenya, now Mt. Kilimanjaro Expedition. I’m now calling from Tanzania. It’s about 9:00 in the morning. We’re almost ready to head out to Kilimanjaro and start our ascent, but I wanted to let you know what we’ve been up to the last few days. A couple of days ago we drove from Nairobi down southern Kenya to the slopes of Kilimanjaro, but still on the Kenya side. We went to Amboseli National Park, which is a game park of course. We did an evening drive into the park where we saw tigers with 4 cubs, which is pretty rare. That was really exciting for us. We spent a long time watching them. Then of course, when we drove on further, we saw hippo, gazelles, elephants, antelope, wildebeest, hyenas, and lots and lots of birds. The only thing we didn’t see in the first few hours was a giraffe. That night we slept in the middle of Amboseli in some canvas tents, which was awesome. We had a great dinner prepared by our cook Wilson, who is really amazing. The next morning we did an early morning drive where we did actually see some giraffe and then went to a Masai village. In this village they do cultural presentations for tourists. It was very interesting going into the hut of the Masai and talking to a young gentleman named John who told us all about the culture. 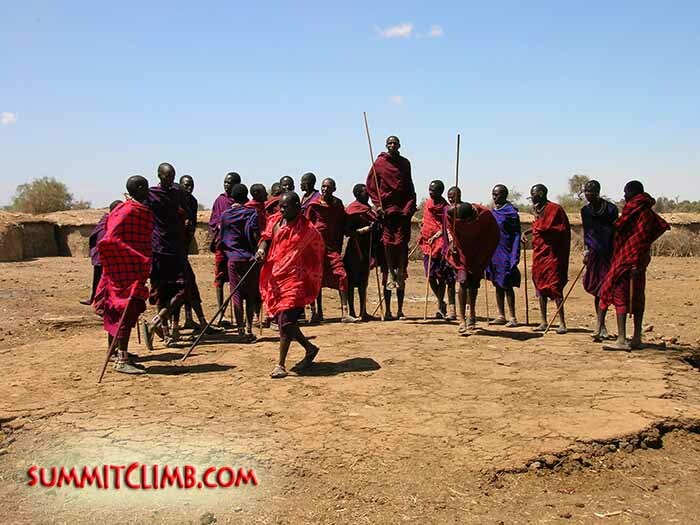 A local tribe of Masai that we visited along our trek and safari (Dan Mazur). Then in the afternoon we went to Namanga and crossed the border into Tanzania. Then we got driven to Moshi, where we are now on the southern slopes of Kilimanjaro. We’re staying in a nice place called the Impala Hotel. We are ready and raring to go up Mt. Kilimanjaro. We were treated to a spectacular view yesterday of the mountain with a double rainbow literally framing it. I think that is a good omen for our trip. We’re looking forward to it. I will call back in as soon as possible. Everybody is doing great. We are now Kevin, Ben, and myself and are all happy and healthy and had a good night’s sleep, so we’re going to be looking forward to getting up. 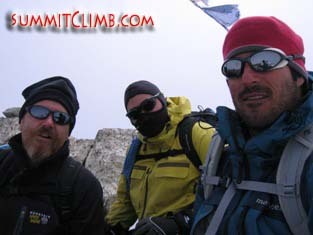 Kevin, Ben, and Doug on the summit of Point Lenana, the highest trekking peak on Mt. Kenya (Doug Sandok). 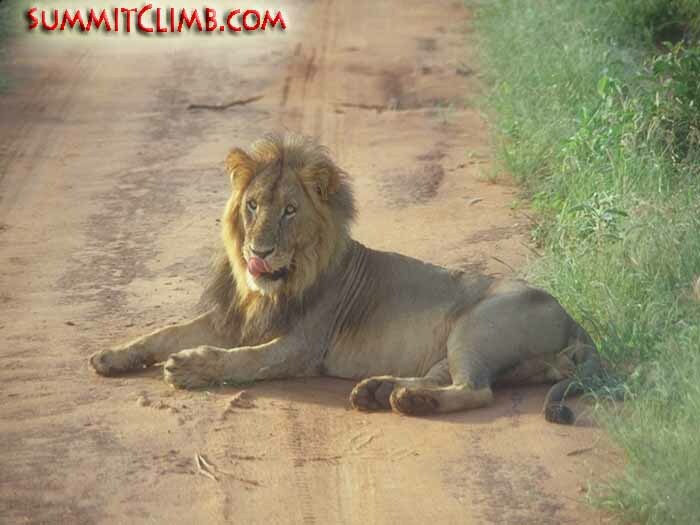 Today is Monday January 21st and we are off to Amboseli today. The team hiking up to MacKinder's Hut on Mt. Kenya (Doug Sandok). Unfortunately the political situation has not gotten better here, and we share our Kenyan friends' concern for what is happening in this otherwise peaceful country. I can assure everyone that we are safe and are easily able to continue on our journey to Amboseli and Kilimanjaro without any problems, however bizarre that seems at the moment. We continue to read the news and talk with our friends and staff here about the situation. Most feel that it will go on for some time and our thoughts are with the families who have been displaced and who have already lost loved ones to the violence. Kofi Annan is scheduled to arrive here in a few days to help the situation, which may stabilize it, but not for sure. Already we have seen collection boxes to help the displaced families in many locations. We keep our fingers crossed that it ends soon and we will continue to keep on top of the situation and hope for a solution to end the violence. So, today we are off to Amboseli Park for the night and will continue to Tanzania and Mt Kilimanjaro a day ahead of schedule. We plan to use the extra day we now have on Mt Kilimanjaro. Lastly, Marc Booysens, our Leader in Training from South Africa, heads back home today. It was fun having Marc and I hope you all can meet him on future climbs. Hiking up toward Tarn Hill on Mt Kenya during our January expedition (Cheryl Goodwin - Good2GoPhotography.com (all rights reserved). The team is heading to Chogoria Bandas then back to Nairobi. Good morning SummitClimb. This is Doug with the Mt. Kenya Expedition. It is Saturday morning here in Kenya and it’s another cloudy day. I imagine it is still snowing up high on the mountain today. We are headed down to Chogoria Bandas, which is our next stop down the Chogoria Valley today. We had an all right night. I think it was good to be down low and getting some good oxygen, but it was a bit wet again. So we are headed to Chogoria Bandas and then we are heading to Nairobi tomorrow, which is a day ahead of schedule. People should be back in touch in the next couple days, calling home, writing emails, and things like that. We’ll have a night in Nairobi and then we head for Amboseli, which is probably going to happen a day early as well (photo: right: team leader Doug Sandok). Right now I’m standing on a cliff at the campsite at Minto’s Hut overlooking a beautiful lake and we’re all pretty astounded at the weather that’s happening here in Kenya at the equator. So far everybody is doing fine and healthy. We’re all packed up and just about to move out. You can expect to hear from us very soon in the next couple of days. Kevin Murray at Devils Tower in Wyoming. The team is down to Minto's Hut. Hi SummitClimb. This is Doug calling from the Mt. Kenya Expedition. It’s Friday the 18th at about 2:00 p.m. here in Kenya. We were planning to go up this morning, but we woke up and found everything was covered in about an inch of ice. The route was plastered with ice, snow and wind as well. We haven’t had the best weather and were waiting to see if things would clear up to see if we’d maybe have a chance tomorrow, but it is still snowing pretty heavily here at 2:00 in the afternoon. So we are heading down from Austrian Hut down to the Chogoria Valley. Our spot tonight is called Minto’s Hut and is at about 4300 metres/14,000 feet. I think people are a little disappointed that we couldn’t go for the summit, but there is not much we could do. We’re hopefully acclimatizing well and looking ahead to Kilimanjaro. So if I get a signal, I’ll check in from the Chogoria Valley, which we’re looking forward to. It’s supposed to be very beautiful. I’m sure it will be interesting getting down there today with the bit of snow here that’s falling. Our team member Peterson enjoying the view of Teleki Tarn (Cheryl Goodwin - Good2GoPhotography.com (all rights reserved). The team is going for the summit of Mt. Kenya tomorrow. Hi SummitClmb. This is Doug with the Mt. Kenya Expedition. I’m calling in from the Austrian Hut here at about 4900 metres/16,000 feet. Today Kevin, Ben, and I hiked up to Point Lenana. We had a great day and got some glimpses of the route for our rock climb tomorrow, including the summit. We are now preparing to go to bed and tomorrow we are going to shoot for the summit of Nelion. So everything is looking good and everyone is feeling fine. Ben is opting not to go up tomorrow. He is going to conserve his energy and just do some day hikes tomorrow so he can make sure he has enough energy to climb Kilimanjaro, which is coming up next (photo right: team member Ben Vincent). Doug reports in. Team is at Austrian Hut. Hi SummitClimb. This Doug from the Mt. Kenya Expedition calling in. Right now we are at about 4900 metres/16,200 feet. We are almost to the Austrian Hut and left MacKinder's Camp this morning. There is quite a bit of snow on the ground and the visibility is not so great, but it's not a big storm. It just seems to be a little bit of moisture. There is about 3-4 inches of snow on the ground, so we've had a lovely hike today. It's just beautiful. Kevin is already at the hut and just below me right now I see Benjamin and Marc coming up the ridge. They are only about 100 metres or so from the hut. We've been doing great. Yesterday we had a great hike up to the Two Tarns at about 4700 metres/15,500 feet and over to a spot called Arthur's Seat, so we could see all the way around to the backside of the whole massif. Everyone seems to be doing just great. Our food has been wonderful, our porters are great, our trekking guide and cook have been excellent, and we're having a nice time. I will call in later tonight with another dispatch as soon as there is some news to report, but everyone is in good shape and we're sleeping at Austrian Hut tonight. Team is heading up to MacKinder's Hut. Doug reports in. Hi, this Doug calling in with the SummitClimb Mt Kenya expedition. We are all here at 3650 metres/12,000 feet. We started up from the meteorological station this morning after having a great night’s sleep. It’s a beautiful hut there with nice comfortable beds. We had a great dinner prepared by Samuel. This morning it was a little cloudy. We got a bit of mist, but no serious rain. We’re already up past the steeper bit and on to a boggy plateau area with some beautiful grasses and plants. Everyone is feeling good and enjoying the hike. We have got about another 3 hours of hiking, another 600 metres/2000 feet of elevation to go and we’ll be at MacKinder’s Hut tonight. Hello, this is Marc, leader-in-training on the SummitClimb Mt Kenya expedition. We’ve just arrived at the Narumoru lodge, which is at the base of Mt Kenya. At the moment, we are all packing and getting our stuff ready to go inside and start hiking up towards the next station where we will be spending our first night. Other than that, we are all pretty excited. Everyone is packing up and getting ready. It’s going to rain now, so we’re getting fitted up with our water proof equipment (photo right: leader-in-training Marc Booysen). The drive up from Nairobi took about 3 hours. There were excellent sub-tropical forests along the way and some big coffee plantations that were quite interesting. Hello, this is Doug from the SummitClimb Mt Kenya expedition. I’m just calling a few minutes after Marc to try to fill in a little bit more. Yesterday we had a great day. We spent the morning taking care of logistics stuff before heading out of town for the afternoon. Once we got to the park, we set up some top ropes and did some great cragging on the boulders. It was a beautiful area. On the way we saw some giraffes and zebras off on the savannah beside the road. We climbed through some interesting baboon territory on the rocks. We got back to town and ate a nice dinner, then went out to see some of the night life in Nairobi. Everybody is here at the entrance to the Mt Kenya National Park right now. We’ve got our porters and are getting ready for a 9 kilometre/6 mile hike today. We’re heading up to the meteorological station, where we will be camping for the night. Doug Sandok checking in from Nairobi. Marc Booysen (Leader in Training) and I arrived two days ago and were greeted by Charles Muthenge, our guide for Mt Kenya, and another of our support staff, Michael, at the airport. We went with Charles and a local friend named Joseph, a fine young rock climber, who my be joining us on Mt Kenya in a few days. We managed to knock off 5 or 6 routes before changing to a more shady section and climbing a bit more before heading home. It was a wonderful day in a spectacular location and a great warm-up to Mt Kenya. Nairobi, and indeed all the areas we traveled through so far, have been calm. Though there is a conspicuous lack of tourists steered away by the post election violence here, everything we have seen so far has been calm and unaffected. There is no lack of food, water or services anywhere we have been. Many of the people we met who rely on tourism for their daily living, such as the curio sellers and tour guides, were very happy to see us as there business and their livelihoods have already been heavily affected by the current lack of tourists. Although we may see a different situation further west, there is nothing to indicate any danger or difficulty for our group right now. The political situation is obviously of concern to all the Kenyans we have met with and spoken with, but everyone expects the situation to resolve and the current calm to remain. Marc and I are looking forward to everyone's arrival and to heading out to the beautiful Mt Kenya in a couple days. I will post more updates as we have more news and adventures to report.